I frequent California's central Sierras, camping every month with a goal to match my age in nights out each year; often solo. Summer trips typically last 5 to 10 days; 40 lbs (18 kg), about half food related; about 5 mi (8 km) per hiking day. I winter camp most often at 6,000 to 7,000 ft (1,800 to 2,000 m); 2 to 3 nights; 50 lbs (23 kg); 1 to 4 mi (1.6 to 6.4 km) on snowshoes. 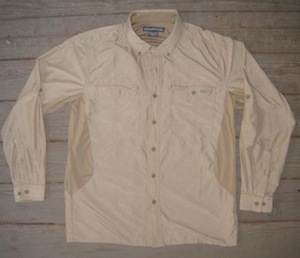 For weather and brush protection I always wear long sleeve shirts most often with a collar. Sizes: Men's S, M, L, XL, 2XL, 3XL. This is a long sleeve, button collar, square tail shirt made from three kinds of fabric. Most of the shirt is hard twill, feeling smooth. Three areas are stretch fabric with a soft, but not as smooth a feel. The armpit-side area has this stretch material, as does a back panel. Pockets include mesh fabric. There could be a fourth if the material lining the cuffs and neck is any different from the stretch material. COLOR: I am thoroughly delighted with the "walnut" choice of color--dark enough to look clean all day, and light enough to reveal ticks. I would not be partial to the other choices of white and blue. Stretch material extends the greenish hue of the shirt. ARMPIT-SIDE: The shirt builds in separate panels on each side, each panel being comprised of 4 smaller panels. At the armpit, the panel is about 4.5 in (11 cm) wide, extending in a bullet-shape taper about 9.5 in (24 cm) up the sleeve and 12.5 in (32 cm) down the side. BACK PANEL INSERT: The built-in back panel is about 26 in (66 cm) long, the length of the shirt from the shoulder yolk to the bottom hem; in a straight taper from about 3.5 in (9 cm) at the top to 2.5 in (6 cm) at the bottom. COLLAR: The button-down collar has a rise of about 1.5 in (4 cm) at the center of the neck in back, and about 2.5 in (6 cm) at the buttons. Collar features a 1.25 in (4 cm) extender to the neck dimension, running about 15.25 in (39 cm) of the total 19 in (48 cm) collar length. Three hook & loop tabs of about 0.75 in x 0.75 in (2 cm x 2 cm) secure the extender when not in use; and release to allow the extender to be folded up as desired. 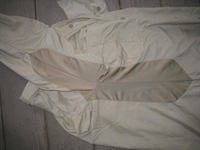 POCKETS: Shirt has 2 breast pockets visible plus an "invisible" pocket behind each. Outer pockets are about 5 in (13 cm) wide by 7 in (18 cm) deep and are open at the top. The left pocket buttons in the center top. The right pocket uses a hook & loop closure instead of a button. Each pocket chamfers off the inside top and bottom corners, lessening capacity by about 2 vertical inches (5 cm) on the inside edge. 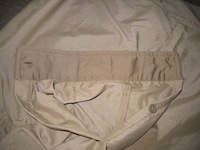 Each pocket has a vertical French seam in the center. The left pocket partially obscures a zippered pocket behind it. This pocket is about 6 in x 6 in (15 cm x 15 cm) with a mesh front and fabric back and is a pocket all by itself, attached only at the top. The right pocket follows the same idea but has no closure and is about 6 in (15 cm) wide by 11 in (28 cm) deep. Tag says these pockets are for passport and boarding pass respectively. This seems a little overthought to me as a local backpacker and not a world wanderer. Perhaps the features could be useful, but I don't much care for the loose material of the pockets having their own mind to migrate around inside the shirt. I'll be using this shirt extensively in the brush; probably not at all in an airport or train station. The left inner pocket includes a white grosgrain loop about 2.5 in (6 cm), which I think will most ideal for securing a car key/split ring with the added protection of being zippered in. BUTTONS: Two buttons hold collar points in place; 1 button closes the left pocket, or at least buttons it, anyway; each cuff has two buttons and one more half-way up the 8 in (20 cm) opening plus a button at half-sleeve; and the front has 7 buttons. Additionally, the care tags have spare buttons sewn on--neck button, collar button and cuff/front. Curiously, the neck button is a different style that looks very much like I lost it and replaced it with something I found in the bottom of the hamper. The thread for this button, and the corresponding buttonhole, are green. Indeed the brown of this shirt has pronounced hints of green, and this thread goes all the way to Ireland. Buttons are "rubberized," which I think means they aren't as brittle. SLEEVES: Cuffs offer two positions when buttoned, and the opening also includes the button at half-way with a loop for the sleeve roll above the elbow. SUN: The material is rated UPF 30+. Cuffs, neck, back insert and armpit/side panels are Sol Cool fabric claimed to make the shirt more comfortable in heat. I sunburn easily; mosquitos like me; and XC brush leaves it mark. I always wear long sleeves and prefer a high collar. I like to rinse out my hiking clothes every day, conditions permitting. Material should to be thick enough to provide the protections I require; yet thin enough to dry in less than an hour. I don't like shirts that get quickly stinky or feel sloppy, sticky or scratchy. The material needs to let go of dirt easily as I most often merely thrash in plain water. Ideally the fabric will resist snagging and puncturing or tearing on brush. On the fashion side, I don't much care for pilling; and I prefer shirts that are reasonably wrinkle-free. At home the shirt must not require special attention. I've sampled many shirt options over the years and I've been most satisfied in summer with thrift store synthetics. I typically wear out a couple shirts a year from rinsing, wringing, flinging, sunning, granite bites, brush rips and backpack friction--not an issue at $4-$5 a shirt. a) OUT OF THE PACKAGE: Shirt came carefully folded and nicely presented without a lot of packaging hype. No pins; single sheet of paper; sealed plastic wrap. I cut off the tags and put it on; liked it so much I wore it all day. (Most often I have to wash new fabric or I soon get an itchy rash.) I would think there is a bit of extra loose thread on a shirt of this price range. The weight specified above includes the extra buttons and care tags, along with the hang loop on the shoulder yolk, none of which will be left in place. b) FIT: Sizing confused me as there is much website (and product tag) noting of three different fits for men. Customer Service explained to me that the Hybrid comes only in one fit (website actually does say that on the specifics for it, though the shirt tag touts all 3) and recommended large, which was exactly right. The shirt fits loosely enough to feel wonderfully comfortable, while looking tidily trim. My resident fashion guru applauded the appearance, remarking that it looks terrific. c) HAND: In the context of synthetics, I find the feel of the material quite satisfactory. It's thin, light and deliciously supple--just right for summer backpacking. d) PERFORMANCE: I wore the shirt for 10 hours in temps from 65 degrees F (18 C) to just over 80 F (27 C). The material wicked off moisture well, and dried quickly. It didn't have the 'plastic wrap' feel of lesser synthetics. It felt hotter than cotton, but didn't get sloppy, sticky or heavy as the day wore on. The stretch fabric parts of the shirt allow full freedom of movement while retaining a smart look. I'm not sure about the depth of the chest pocket. I'd put my phone in the pocket and when I tried to retrieve it I was met with a bit of difficulty mining it out of such a deep hole. I'm pretty sure the chamfering at the pocket top corner is to let the fingers choose between the inner and outer pocket, which makes great sense; and I'm very proud of myself for figuring this out. e) AFTER-WASH: Shirt came out only slightly wrinkled. It smoothed out on the hanger rather well, though it still has the fold creases from packaging. Care instructions suit me--machine wash with other stuff and air dry. I always air-dry performance synthetics and wool, so I don't count that as special treatment. I would never iron it, as I never iron. My first impression is all positive. This garment's going to get a real tough workout and have a great chance to prove its durability and overall performance. I'm going to feel bad if I wear it out in testing, as it's exactly the kind of shirt I'd like to wear around town. June 16 - 20. Castle Crags Wilderness, Northern CA, USA. In 4 days I hiked in the shirt 10 1/2 hours over 9 miles, half cross-country through intense brush. On three of those days I rinsed the shirt out after hiking and slept in it; and one day I pulled it over the top of my mattress as a cover. Temperatures ranged upwards of probably 90 F (32 C) under sunny skies in what felt like very low humidity. Terrain was often steep and smothered in 2 to 6 ft (0.6 to 2 m) of manzanita and huckleberry bramble. On the fourth day I rejoined the family outing and sat in 100 F (56 C) heat in camp. July1 - 5. Carson Iceberg Wilderness, Northern CA. Temperature range about 60-85 F (16-30 C); 2 light thundershowers. I backpacked in it about 5 hours total and hiked for about 3 hours; slept in it all 4 nights and otherwise wore it continuously except for a few hours to rinse and dry it one day. July 21 - 28. Emigrant Wilderness, Northern CA. Temperature range about 50-80 F (10-27 C); 1 light rain. I backpacked in it about 24 hours in a total wearing time of about 133 hours; rinsed it out 5 times; slept in it 7 nights. Cleaning: On 11 afternoons I rinsed the shirt in the bottom half of a milk jug using only lake water, no soap. The water got dirty, and the shirt rinsed satisfactorily clean on the second rinse. 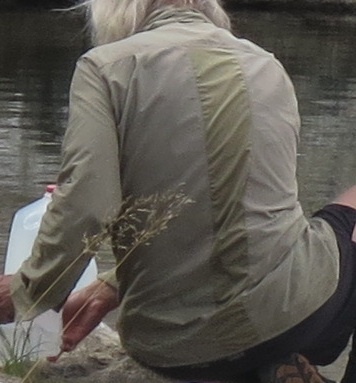 I don't rinse at the lake and don't like making more than one water trip, so I was pleased with the relatively small amount of water required to restore the shirt. The shirt requires more than an hour in the sun to get completely dry. The collar and upper area of the shirt don't let go of the dampness as easily as the rest of the shirt. It appears the SolCool material, especially where backing other material such as cuffs and collar, extends drying time rather significantly. I was surprised the shirt smelled as clean as lake water and looked fully refreshed. Evidently I waded through some tree snot on the last outing and was surprised to see that even a couple of cold water rinses diminished it. Comfort: I enjoyed wearing this shirt. It didn't get sticky, tight, hot or sloppy. It also felt comfortable enough sitting around camp. I am most impressed at how the shirt remains comfortable as the day wears on. I typically had the shirt on for 21 hours a day. The SolCool fabric can feel lightly sweaty and takes a while to dry. During the Castle Crags hiking hours I was working as hard as I ever can, carrying 30 lb (14 kg) in high heat through heavy brush on steep terrain. Several of the Carson days were hot and muggy. I wasn't comfortable, but I would have expected to feel worse. The Emigrant trip greeted me with persistent light rain, but I never got wet enough to feel uncomfortable. Somehow the material seemed to dry from body heat faster than the rain was coming. I'm sure it could be overcome, but I never bothered to remove the shirt and considered (though didn't count) it rinsed out from the rain. The next seven days were intensely hot and sunny at around 8,000 to 9,000 ft (2,400 to 2,800 m). Except for the collar and cuffs (and of course under the backpack) the shirt kept remarkably dry. Sun protection: I don't like feeling icky with sunscreen. As thin as the material is I didn't expect it would block harsh sun so effectively, but the proof for me is white under the shirt and red outside it. I pulled up the collar extender. The extender may be overkill in its construction, and certainly I think the hook and loop fasteners are. I'd prefer having a shorter extender that likely would stay just as far up the neck and not take up three layers when not needed. I dislike the feeling of wet material rubbing on my neck and at times I did notice it. I think working hard in intense heat, the only way not to have wet collar and cuffs is not to have any; and I can't help but wonder if the SolCool is a net gain. Pockets: I started off with not much of an open mind about the "invisible" pockets and I'm near the point of evaluating whether to cut them out. First, it is too difficult to drop something in the front pocket and not the "invisible" pocket behind it, especially the pocket with no zipper. I carried a watch-piece in the pocket(s) and found it almost impossible to fish out. I'm hanging onto brush with one hand and trying to reclaim the watch with sweaty fingers from a dampish pocket and I can't find it. I have to unsnap the chest strap, which lets my camera and GPS fall off. When I finally locate where the timepiece is, I can't tell if it's in the front pocket or the "invisible" pocket. When the latter, the pocket itself skids around while the watch piece hangs up in it. Also, when I put the shirt on, I have to fiddle with the "invisible" pocket material to get it settled in place. Maybe that seems tolerable, but when the skin is the slightest bit moist the material won't slip down. This pocket material also adds drying time. I probably wouldn't like the thread lines from sewing these "invisible" pockets in place. I would rather not have them. I've worn the shirt a total of 609 hours: 76 hours backpacking 87 mi (140 km); and 24 nights sleeping in it. I've machine washed it 6 times and hand rinsed it 19 times. Nearly all days of wearing the shirt were either hot or nasty hot. 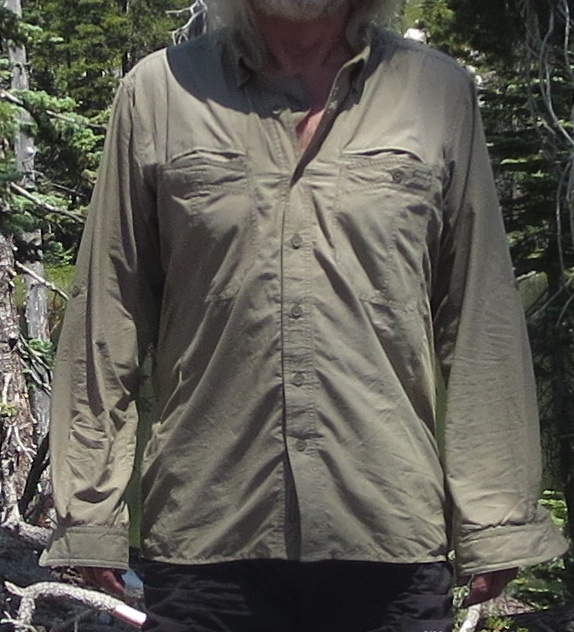 For backpacking applicability this shirt rivals the peanut in closeness to perfection. I am thrilled with the comfort of this shirt and duly impressed with the fabric's durability. This shirt withstood an egregious amount of poking, pinching, scraping and abrasion. On the last outing I walked into a broken branch hard enough to make a bloody 1 1/2 in (4 cm) cut in my arm, but somehow the fabric resisted damage. There is the slight evidence of pilling, which for the torture I imposed on this garment strikes me as incredible. There are no snagged threads sticking out as I expected would surely happen on a soft synthetic. It seems to have the toughness of wool. The only marks on the shirt that make it look used are spatters of tree snot, an occupational hazard I doubt any garment can foil; and almost imperceptible blood stains after hand rinsing. The shirt does not accumulate offense to the nose and refreshes easily; the fabric seems to have a non-stick feature for dirt, stink and blood. Placing it on sun-warmed granite dries the shirt completely in less than an hour--somewhat faster than hanging it on a bush. The shirt has never gotten sloppy wet on me and most of it seems to dry almost as quickly as conditions endeavor to dampen it. I never encountered cold temperatures in the shirt and twice I dried it by wearing it. I like the zippered pocket for 1st and last day security of my "wallet pack"; and the loop inside that pocket where I can hang my car key for secure, ready access. The test protocol during the last outing evidently exceeded the limits of one part of the garment's sewing. The SolCool fabric center seam down the left side of the shirt has three stitch lines and 5 in (13 cm) of one line came undone. The garment did not open up--saved by the remaining two lines--but I will want to mend it before my next outing. I'd still get rid of the "invisible" pockets. I rarely hike with sleeves rolled up and I'd most likely do away with the loop and button to hold a roll above the elbow. In fact, I'd prefer getting rid of all the sleeve/cuff buttons and make the sleeve a cuffed tube. I'm unsure about the SolCool fabric, but I've noticed my collar and cuffs don't drip or even saturate. If that is the result of the SolCool, then I'm all for it. I would do away with the collar extender and the hook and loop tabs. I regard these modifications as minor and give the garment very high regard. Thank you ExOfficio and BackpackGearTest.org for the opportunity to test this product. This concludes the test.